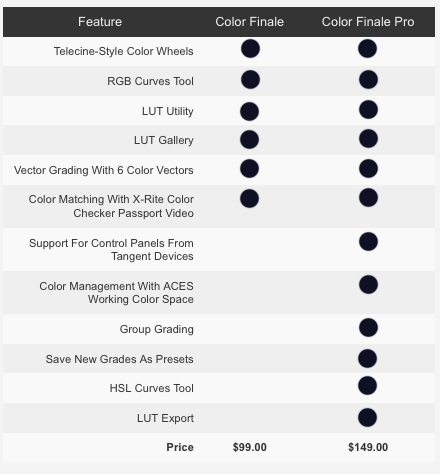 Abe asks: I’m thinking of switching to Color Finale Pro from Davinci Resolve Lite – is it worth the $99? and what’s the difference between Color Final Pro and Color Finale? Answer: Price and features between each are two differences. The standard version of Color Finale costs $99 while the Pro version is $149. Features like better color with Academy color science, more speed with Tangent control surface support, better efficiency with group grading, color grades can be saved as presets are not in the standard version. With Color Finale you’re already getting a substantial boost over the native FCPX grading controls, but the professional features are almost certainly worth the extra money. If you’re an existing Color Finale user you can upgrade for $50. Also when you install the Pro version it installs along side Color Finale, so your previous grade and projects are unaffected.